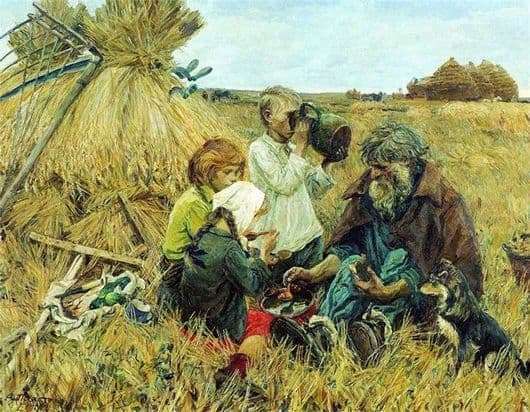 Plastov, in his paintings quite often refers specifically to the peasant motives of Russia, namely to the one that will never return and has long sunk into oblivion. In the canvas called “Harvest” master skillfully shows the moment when the whole family sat down to rest. At that time, they had already mowed down all the wheat and laid their braids aside, stacks and sheaves were ready, and therefore, in the distance, one could notice how the peasants had already begun to take them away. The whole family did their best, starting with the youngest and ending with the oldest grandfather, so they all together took up spoons and were getting ready for dinner. It is worth noting that the artist is very picky about details and therefore depicts a jug in the hands of one of the boy, from which he apparently drinks milk, in such a jug, it does not heat up and keeps the optimum temperatures for a long time. The outbred dog is humbly observing all this action, in the hope that he will get something from the peasant “table”. Despite the fact that at that time everyone was walking barefoot, the artist, again paying attention to details, focuses on the old man’s shoes, since without any particular problems you can beat your legs. Naturally, the old man remains in the most vivid and colorful way of the picture, he has a beard and thick uncombed hair, holds the edge of the bread with one hand, and the other spoon from the tree with which he most likely draws soup. The whole outfit of the old man is very simple and consists of pants and a shirt in blue. Children also do not differ in the diversity of their wardrobe, but neither this is the center of the picture and its thought, the main thing is the huge field that stretches around them. This picture provides its viewer with a joyful, clear and bright feeling of that bygone pore, against the background of the most beautiful vast expanses of Russia. It is these emotions that the artist tried to put into the picture, and he did it perfectly.